Build quality can suffer when so many small components come into play, but each panel, bracket and mounting plate feels solidly assembled. Certain elements are perhaps too tightly knitted together - the front panel requires some force to remove, and so too does the large shroud on the side of the PSU bay. 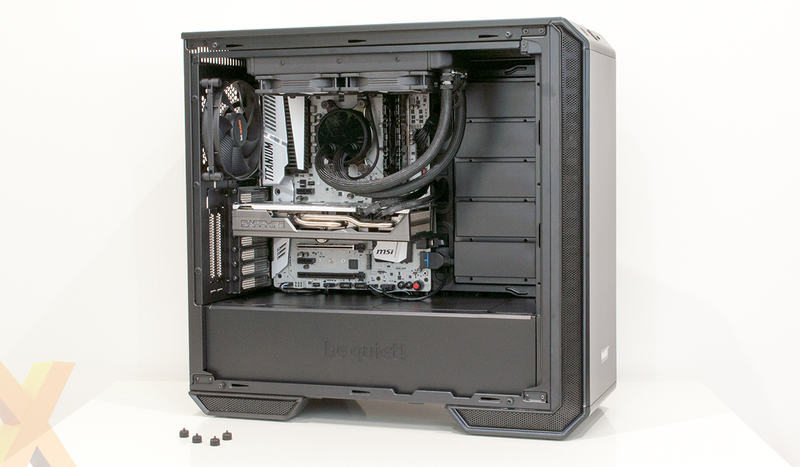 Continuing a robust theme, the two pre-installed fans are 140mm units from be quiet! 's SilentWings 3 PWM range, while the front, top and rear side panels are all lined with noise-dampening material. be-quiet! 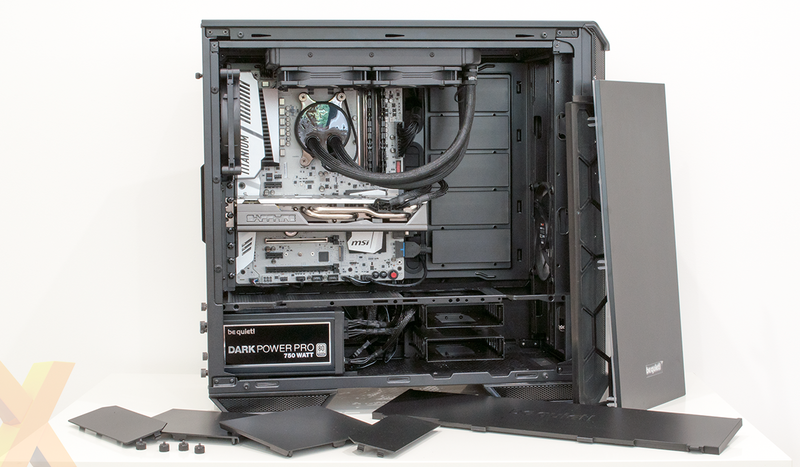 's roots lie in the air-cooled scene, yet having released its own line of liquid coolers in 2016, it is no surprise to find that Dark Base 700 offers plenty of mounting points. Both the roof and front of the case can accommodate three 120/140s, the rear mount is a single 120/140, and there's room on top of the PSU shroud for another 120/140. Installing one or two large 240/280/360mm radiators shouldn't be difficult, though the small slits on top of the case may limit upward airflow. 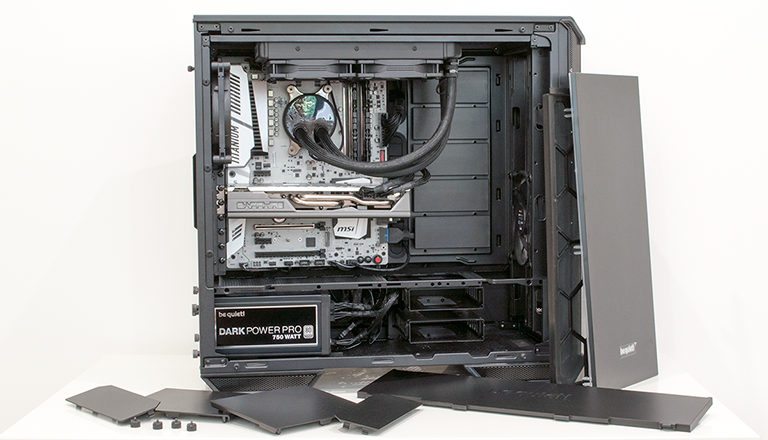 The good news for users wanting to keep things simple is that the Dark Base 700 build process is only as complex as you want it to be. 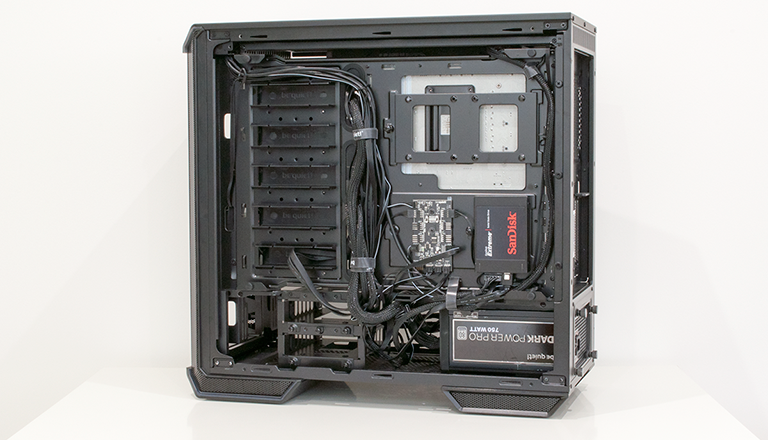 When used as a traditional case, everything slots in with relative ease and storage bays are plentiful. 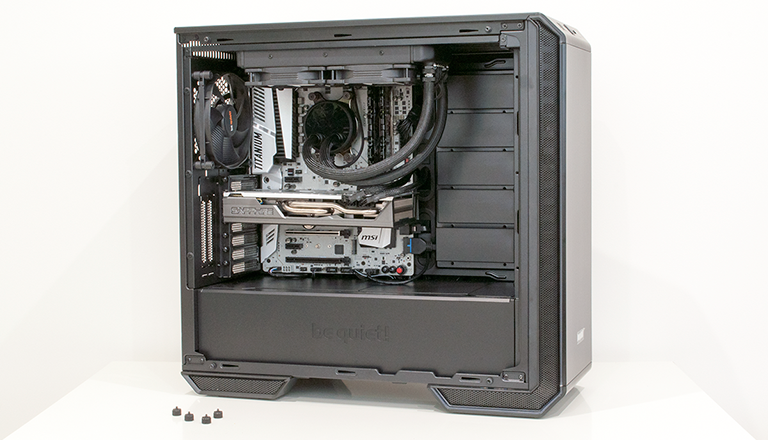 A trio of 2.5in sleds is attached to the rear of the motherboard tray and be quiet! 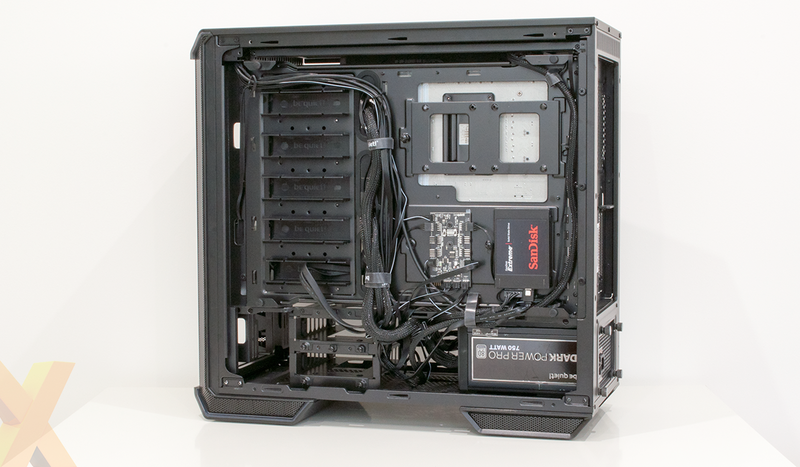 also includes three modular drive bays. These are metal in construction and lined with rubber grommets, and each bay can hold a pair of 2.5in drives or a single 3.5in. Two bays are pre-installed at the end of the PSU compartment, but all three can be removed or relocated to the pre-covered mounts alongside the motherboard tray. There's scope for a vertical graphics card with two additional PCIe slots sat next to the usual seven, though do be aware the riser bracket is not included as part of the bundle. Elsewhere, we like the fact that the PSU shroud is split into four snap-in sections across the top, allowing for one or two to be removed for cabling or liquid cooling, however the gap beneath the PSU shroud and motherboard tray is quite tight, making it tricky to run cables beneath the board. Our updated ATX build looks rather dapper when installed and there's decent clearance throughout. Dark Base 700 supports a power supply measuring up to 285mm in length, graphics cards can extend to 430mm (or 286mm with if a drive bay is in situ), while those of you who decide to stick with air-cooling can install a heatsink standing up to 180mm tall. The radiator does sit a little low due to the pull-out bracket (our 240mm Fractal Design rad annoyingly covers the debug LED on our MSI motherboard) and one other point of contention is the rear side panel, which is notched rather than hinged, making it fiddly to reattach. As versatile as the front of the case is, it's around back that be quiet! has left room for improvement. Though the gap behind the motherboard tray is reasonable, we'd liked to have seen a dedicated channel to run cables, and the default trio of rubber grommets are somewhat small. Helping alleviate these concerns, the covers that sit on the five drive-bay mounts are height-adjustable so that they can protrude at a choice of depths, allowing for cables to pass through. This works quite well, but we'd like to see be quiet! do more with the five mounting points - a reservoir bracket, perhaps? We couldn't find an easy method of making our cabling look ultra-tidy, despite the bundled Velcro ties, and the wires attached to the rear PCB makes the whole area appear busy. A small price to pay for the usefulness of the hub? In addition to doing a good job of fan control, the hub offers an LED connector for the motherboard, allowing the front LEDs to be synchronised via motherboard software where applicable, and power is sourced from a Sata connector. Understanding its expertise as a hardware manufacturer, be quiet! makes the wise decision not to attempt to add any superfluous in-house software utilities. The front LEDs can be toggled between six colours (white, red, green, blue, orange, purple) and two modes (solid, breathe) using the switch on the I/O panel, and anyone wanting to pick a more specific colour can do so via compatible third-party motherboard software.